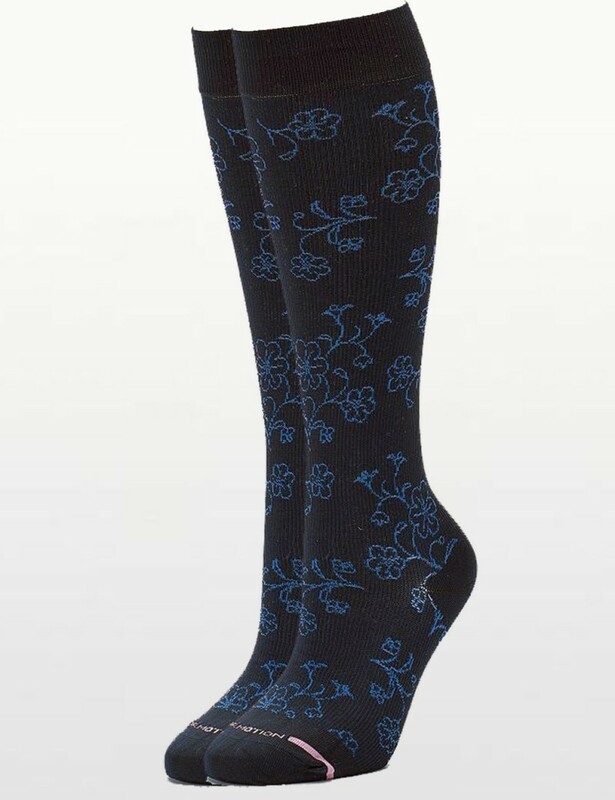 Not your ordinary compression stockings.These Navy with Blue Floral Print womens compression stockings by Dr Motion have graduated support to reduce muscle fatigue, maximise circulation and minimise swelling. Designed for women who sit, or are on their feet all day with a non-restrictive comfort top-band and smooth toe seam for comfortable, all day wear. Not your ordinary compression socks, our socks are colorful, stylish and fun. 50% of over-50s suffering problems with the veins in their legs, wearing super-comfy compression socks every day will help keep legs healthy and fit for longer. At the end of long day most of us can relate to the fact our legs feel tired and heavy. This is because during the day gravity causes blood to pool in your ankles and feet. Our range of products will help you chose something colorful, stylish and fun which will fit your routine no matter what you have planned for the day.